A team of scientists has revealed an internal clock within live human cells, a finding that creates new opportunities for understanding the building blocks of life and the onset of disease. "Previously, a precise point of a cell in its life cycle could only be determined by studying dead cells," explains Alexandra Zidovska, an assistant professor of physics at New York University and the senior author of research, which appears in the latest issue of the journal Proceedings of the National Academy of Sciences (PNAS). "However, with this discovery, which shows that the nucleus exhibits rapid fluctuations that decrease during the life cycle of the cell, we can enhance our knowledge of both healthy and diseased human cells." The study, which also included Fang-Yi Chu, an NYU doctoral candidate, and Shannon Haley, an NYU undergraduate, sought to expand our understanding of the cell nucleus during the cell cycle. It's long been established that the shape and size of the cell nucleus change dramatically during a cell's life. Unknown, however, was whether or not the nucleus changes its shape over short periods of time. This was largely due to technical limitations of carrying out such measurements in living cells. 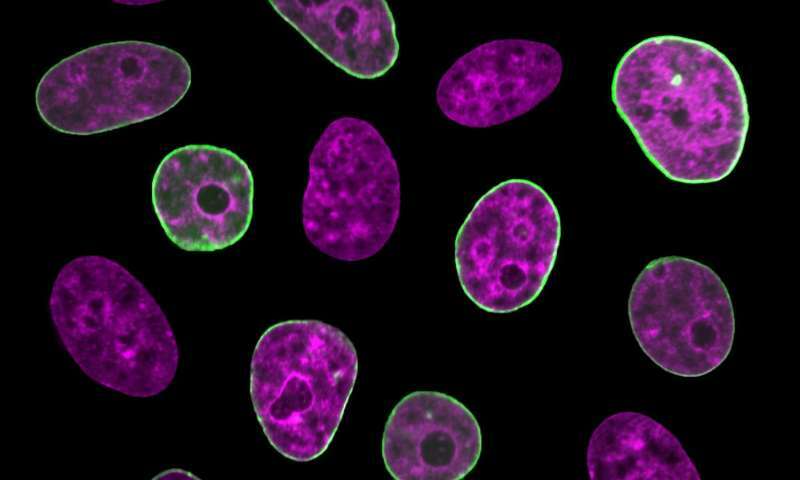 To capture this dynamic, the scientists used a state-of-the-art fluorescent microscope that enables them to see extremely small and very fast shape changes of the cell nucleus in living cells. The researchers discovered that the human cell nucleus has a previously undetected type of motion: its nuclear envelope flickers, or fluctuates, over a period of a few seconds. Notably, the amplitude of these changes in shape decreases over time during the cell cycle. Moreover, this motion marks the first physical feature that systematically changes with the cell cycle. "Therefore, this process can serve as an internal clock of the cell, telling you at what stage in the cell cycle the cell is," explains Zidovska. "We know that structural and functional errors of the nuclear envelope lead to a large number of developmental and inherited disorders, such as cardiomyopathy, muscular dystrophy, and cancer. Illuminating the mechanics of nuclear shape fluctuations might contribute to efforts to understand the nuclear envelope in health and disease."